Although I peruse the solar photovoltaic headlines daily, I didn’t catch the importance of this Boeing (NYSE:BA) press release from the headline, Boeing Wins Contract to Build Solar Cells for Renewable Energy, until it was pointed out to me. SolFocus has entered into a 12-month contract with Boeing’s Spectrolab subsidiary for 600,000 Multijunction concentrator solar cells, sufficient for 10MWp of Concentrator PhotoVoltaic (CPV) panel production. 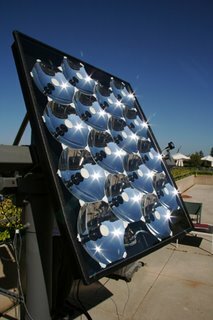 If the SolFocus Gen1 CPV panels indeed have 16 mini-dishes, this is enough solar cells to produce about 37,500 panels. There have been a number of recent articles (The San Francisco Chronicle, Forbes) about Applied Materials (NASDAQ:AMAT) and their push into solar production tools. However, I only saw this ”Applied Materials Going Solar” Webcast Event reported in the EETimes Water cooler on August 26, 2006 as Here comes the sun. AMAT will be discussing their Solar plans on Tuesday, September 5, 2006, at 10:00 a.m. EDT (7:00 a.m. PDT). I am wondering if this will be a simultaneous webcast from Santa Clara and the 21st European Photovoltaic Solar Energy Conference and Exhibition (EU PVSEC) in Dresden, Germany. AMAT is an exhibitor at the EU PVSEC, and I would expect many of their solar experts to be in attendance. I will be attending this year’s EU PVSEC, and I hope to see you in Dresden. ← AstroPower: Decline of a solar photovoltaic star remains an untold tragedy?